Win a Cry Babies Magic Tears doll bundle from IMC Toys! We’re giving three lucky readers the chance to win a Cry Babies Magic Tears doll bundle from IMC Toys! 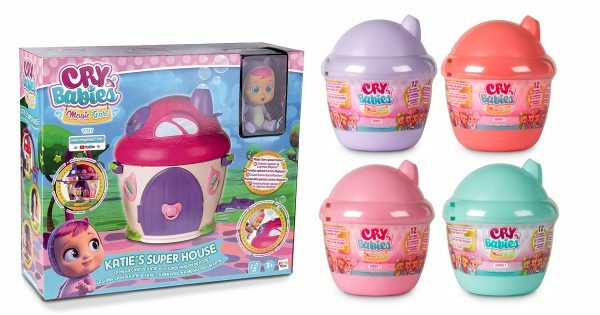 Each lucky winner will receive a Cry Babies Magic Tears Katie’s Super House and three Cry Babies Magic Tears Bottle Houses! As you unbox the mystery bottle house you will unveil the cutest little Cry Baby Magic Tears that comes with 6 fun accessories: a bottle, a bow, a dummy, a chair, and 2 accessories unique to each doll! Open the final compartment to see if you have any surprise golden accessories, exclusive only a few bottle houses! Fill the bottle with water to feed your Magic Tears, watch as they cry real tears when you squeeze their bellies! For your chance to win, answer the question and leave your details before the closing date of Monday 18th February. Good Luck!